Much has been written about the challenges awaiting at-home mothers who decide to return to work. Few of them, though, have a tougher time of it than the stay-at-home dad. At home for two years, Morgan Attwood was hired for an afternoon shift in January. Now, Mr. Attwood and 2-year-old Eli play in the morning before Dad has to go to the TV station. They work on their hair before heading out for the rest of the day. 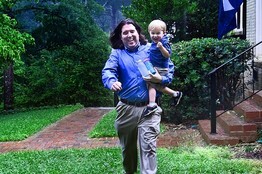 They run through the rain to the neighbor's, where Eli will wait to be picked up by the babysitter. 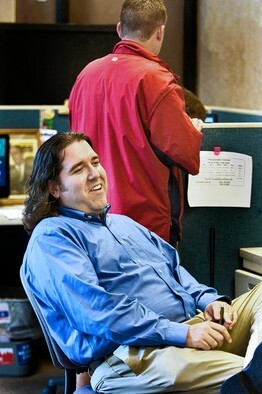 On the job at WOLO, where Mr. Attwood works as a TV news producer. Compared with at-home moms, who outnumber them by more than 5 to 1, at-home dads face a bigger stigma among would-be employers, and they often have fewer opportunities to network from home. Also, they are returning to a labor market where men have suffered major setbacks; heavy job losses in male-dominated industries and middle management have led pundits to label the latest downturn the "he-cession." A record 7.4% of fathers in married-couple families with children under 18 were home in 2009 while their wives worked, based on unpublished Bureau of Labor Statistics data set for release next week. That is up two percentage points from 2008 and the highest on record, says Sandra Hofferth, a University of Maryland family-science professor and researcher on family time use. 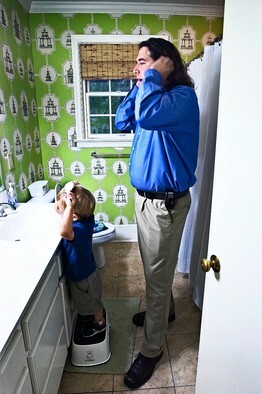 At-home dads who succeed in landing jobs often have to go to extreme lengths to do so. 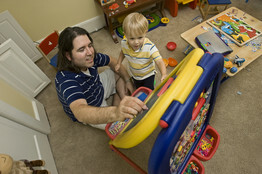 Morgan Attwood was at home full time during the workweek for two years after the birth of his son. He kept a hand in his career field by working weekend hours that no one else wanted. The Columbia, S.C., photojournalist reported for one or two Friday, Saturday or Sunday night shifts each week at a TV station while his wife, a college professor, was home with their son. Giving up weekends "destroyed our social life, and that was kind of a bummer," he says. But staffing at the station was so light on weekend nights that he had a chance to learn every job there. The payoff came last January, when the station hired him full time as a producer. David Hallowes is taking another tack—acquiring new credentials. The Salem, Mass., father intended to go back to work 2 1/2 years ago but found it far harder than he expected. A former operations manager and controller who quit his job four years ago to care for his newborn daughter, he spent a year seeking work in 2007 and 2008 but had trouble getting interviewers to focus on his job skills. "I'd be there with a resumé with almost 12 years of professional experience, and I wanted to talk about what I could bring to the job. But instead, I'd spend the hour talking about what it was like to be a stay-at-home father," he says. Career coaches advise being ready with a quick, confident explanation of why you decided to stay home, then shifting the focus immediately to your suitability for the job. The rejections were dispiriting, Mr. Hallowes says. Many men quit trying at this stage and join the ranks of discouraged workers. Mr. Hallowes delights in his daughter's growth, and in the close bond he has with her, but his desire to return to work has become a passion, he says. He enrolled in grad school full time last year, taking evening and weekend classes while caring for his daughter in the day. He recently earned a master's degree in investment management and will soon take a professional exam for financial analysts. Now that "we're in a new economy, where the ranks of stay-at-home dads have almost doubled," Mr. Hallowes says, he hopes the stigma on at-home dads will ease. The challenges and self-reflection of the past 2 1/2 years will make him a stronger manager, he says. "It's doubtful you will find anyone who is as hungry as I am to return to work," he says. Feeling like a curiosity, or a circus sideshow act, as some men describe it, is a pitfall that trips up many job-seeking dads. Dennis Findley, a McLean, Va., architect, says he learned during his 11 years at home with his twin sons to sidestep the problem by keeping everyone he met focused on the fact that he was an architect. "At a cocktail party, the conversation turns to, 'What do you do?' Someone says, 'I'm a lawyer, what do you do?' If you say, 'I'm a stay-at-home dad,' the conversation ends. What are other men going to talk about with you? 'Do you like Velcro on your diapers?'" he says. Instead, he always answered, "I'm an architect." Mr. Findley also held to the principle that no networking opportunity is too small, and during his years at home he seized every chance to meet people, from community projects to manufacturers' seminars. These tactics helped him build a residential architecture practice from home and aided his eventual return to work at an architectural firm in 2006. In another lesson, Ira Montague says he learned not to mention "stay-at-home dad" on his resumé. A former creative director for an ad agency, the Wayland, Mass., father has been home with his adopted daughter, now 4 years old, for three years, and looking for work for about half that time. At first, he proudly put his fathering role on his resume. "I thought it could be an asset," Mr. Montague says. But like Mr. Hallowes, he found interviews "went off on tangents, talking about how lucky I had been and what a great experience I had," he says. "I would leave thinking I had made good connections" but then would hear nothing. His resumé now lists only his professional experience; he mentions his time at home with his daughter in cover letters. Dads sometimes organize networks of their own to ease the isolation they face in neighborhoods populated during the day by at-home moms; those can also double as back-to-work networks. Mr. Montague set up an informal work-finding group with a half-dozen friends and former co-workers called "Creative Services"; members give each other referrals to free-lance and project work. Recruiters say dads should consider full-time temp work, or even a career change, because many of the executive or middle-management jobs they had aren't coming back. Firms that have traditionally helped at-home mothers find flexible, temp or part-time work are seeing a rising tide of males. At MomCorps, an Atlanta staffing firm, men in its 45,000-worker database have risen to 10% from 5% five years ago, says chief executive Allison O'Kelly. Flexible Resources, a staffing firm in Stamford, Conn., has seen a doubling of male applicants in the past year to more than 100. Among hundreds of attendees at several career re-entry conferences held since 2008 by iRelaunch, of Newton, Mass., 5% to 10% were men, says Carol Fishman Cohen, an author and the firm's co-founder. For some job-seeking dads, the toughest transition is the mental one. "We really have to hit this hard with men: We have to tell them to park their egos at the door," says Nadine Mockler, co-principal at Flexible Resources. "With men, their entire identity is in their work, and with women—not so much," she says. "They have to be willing to take off their big-company hat, roll up their sleeves and, if an employer wants them to go buy paper clips, they may have to do that."